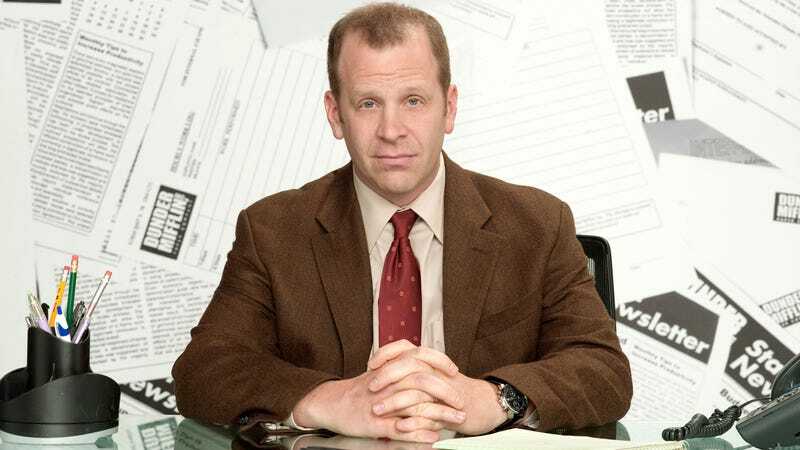 The Office’s Toby Flenderson, one-man HR department and Michael Scott’s human punching bag, is a tremendously sad character. Over the course of nine seasons, viewers were asked to feel sorry for Toby as we see how much he hates his job, hear about his horrible divorce, and shrink in second-hand embarrassment or outright revulsion as he tries, very poorly, to express his feelings for Pam Beesly. Now, however, any sympathy Toby may have garnered is being called into question, as the internet closes in on the identity of the show’s Scranton Strangler, the mysterious killer stalking Pennsylvania. Twitter user Spencer McClure, likely having obsessed over the inadequately solved mystery for years like a real-world Rust Cohle, has resurrected the case and, well, it doesn’t look good for Toby. The thread continues by profiling Toby psychologically, noting his simmering resentments, difficult personal life, and the notable fact that the Scranton Strangler was first mentioned on the show at the same time as the birth of Pam and Jim’s child (a scene in which Toby was conspicuously absent, presumably deeply traumatized by his unrequited love). More damning is the O.J. Simpson-inspired episode where the office watches Scranton police chase down the Strangler and where Toby, again, is absent. The coincidences continue to accumulate. Toby defenders will point out that the HR sadsack actually served on the jury that tried the Strangler. Later, Toby was so wracked with guilt at the thought of condemning an innocent man that he visited the prison only to be attacked by the presumed killer. The naive see this as a sign that Toby could not have been the Strangler, but open your mind to the depths of the conspiracy and the flaws are immediately clear. Spurred by McClure’s reopening of the investigation, other amateur detectives provided further evidence. Whatever the case, the Scranton Strangler mystery must come to an end somehow. If the show’s revival goes forward, the thought of a ruthless serial killer still stalking our paper-pushing friends would require a drastic overhaul in tone and quality. Actually, remember how the last couple seasons of the show played out, this would probably be fine.